The Mountain View-based organization that has been scanning the skies for signs of alien life for more than 25 years is now searching for funding to continue its mission. 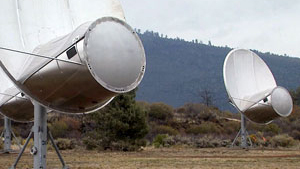 Cutbacks in state and federal funding have forced the SETI Institute to shut down its Allen Telescope Array of dishes. However, scientists say they've been forced to turn off their electronic ears just when they've identified a number of planets that could harbor life. We discuss SETI and its importance.